The Paris Choral Society and the Paris Symphonic Orchestra are giving a concert of Mozart’s C Minor Mass and Richard Burchard’s Salzburg Missa Brevis, directed by Zachary Ullery. 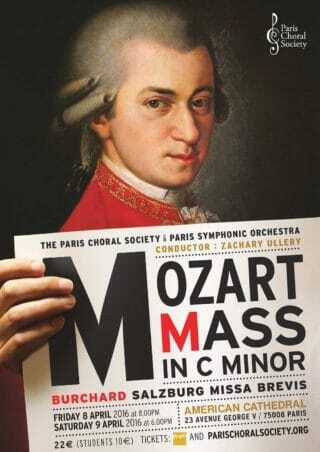 Mozart’s C Minor Mass (also known as The Great Mass) is an unfinished, large-scale work for solo sopranos, tenor, and bass, two choirs and orchestra. This mass setting won’t disappoint, despite the incomplete “Credo” and the missing “Agnus Dei.” Fervent and virtuosic “Gloria” and “Qui Tollis” movements will leave you breathless and our mastery of the fugue* section will blow you away. Sweeping solo sections interspersed with choral movements will add to the excitement. All of this accompanied by our partner group, the accomplished Paris Symphonic Orchestra. Living American composer Richard Burchard’s Salzburg Missa Brevis was inspired by the choral performances he heard in Salzburg, Austria’s various churches during the twelve years he spent teaching there. Static textures and dissonance leading to beautiful resolutions mark this setting of the Catholic mass text. This a cappella* gem of a piece will soothe in comparison to the intense Mozart mass. This concert of two very different masses is not to be missed!